BionX D-series is the latest Hub motor from BionX. Owners reported this drive is the "wolf in sheep's clothing" as it draws >1000W from the battery (measured by owner), and at the same it isn't sufferend from the overheating issues the previous motor generations had in steep terrain. 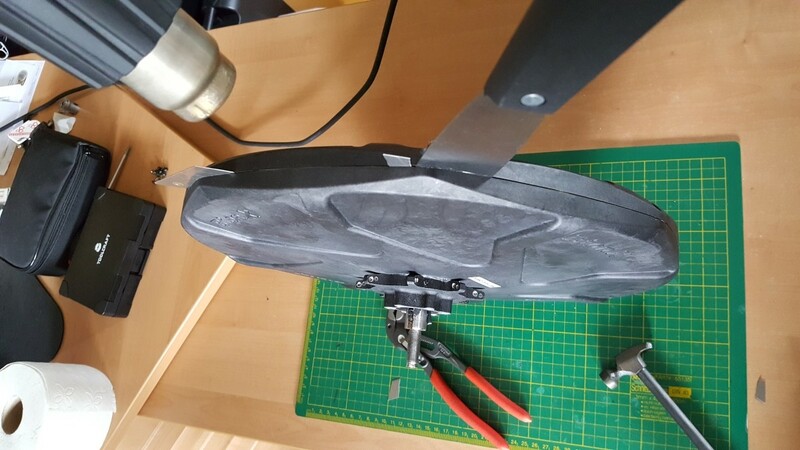 Another awesome feature are the centered spokes which should improve the flex (mass dampening) and stability of the (bicycle) wheel. 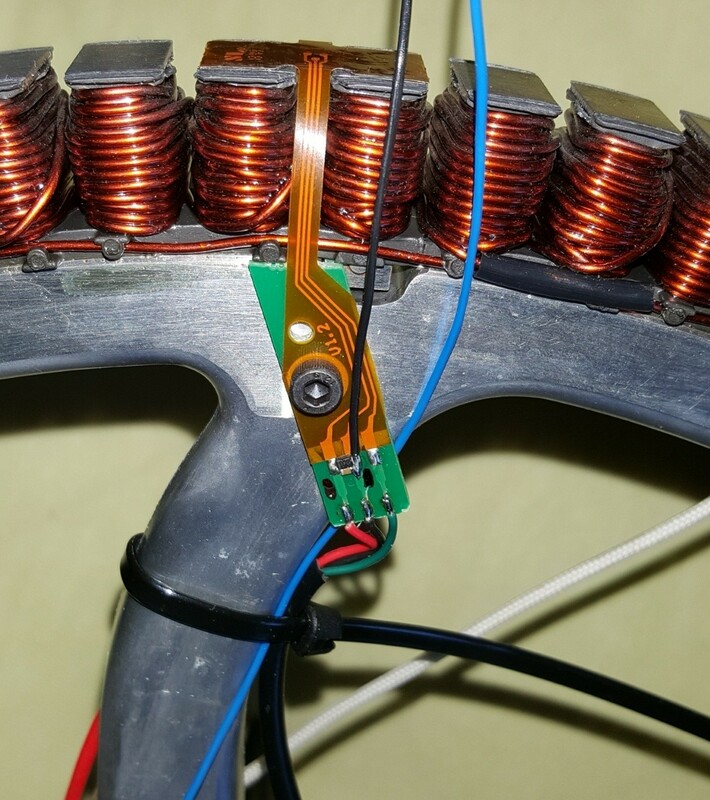 The stator is 12mm wide, while the magnets are 11,5mm. I counted 33 laminations which results in a thickness of 0,363mm (older bionx motors had 0,5mm). 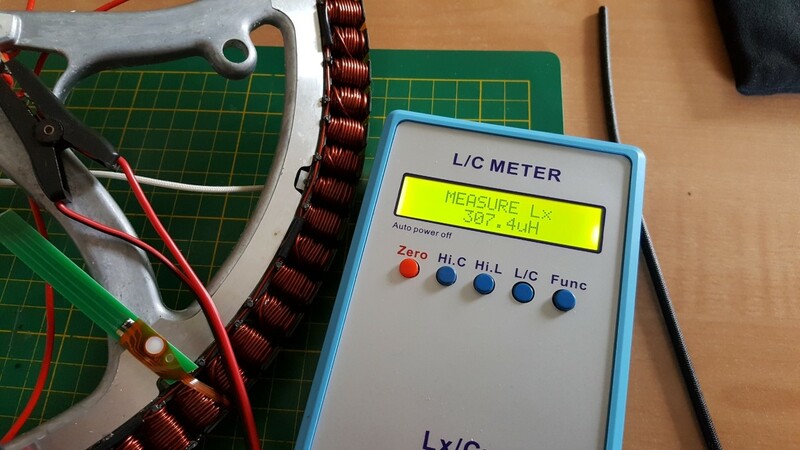 I was hoping for thinner ones, but later tests when measuring kV will tell the no-load watts and RPM limit exactly. winding is 1 strand and 4 groups in parallel. I guess it is terminated in delta because i could not see a star termination. 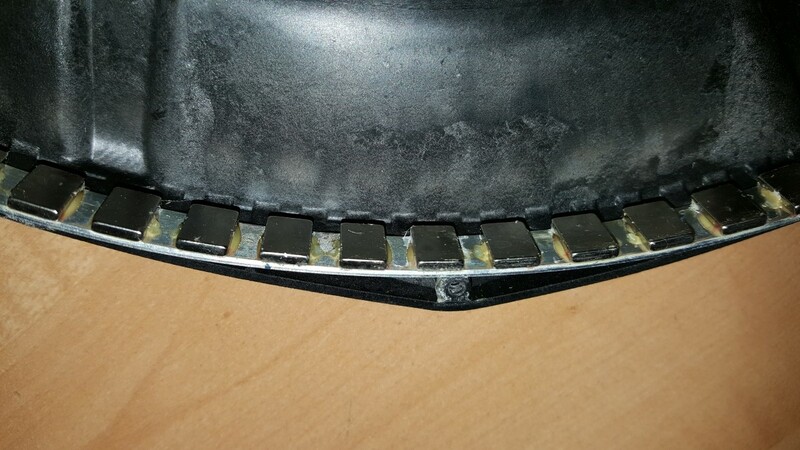 When looking on the stator teeth, i wasn't able to see laminations. It did look like one big part of metal. This must be the case on all D-motors as i noticed when comparing mine with pics from others taken from the stator. I believe the stator had been put into a lath for making it perfectly round. Due to this, the lams are all shortened on top. I don't know if electrically connected lams are a problem (mostly in view of eddy losses), but as a precaution i grinded the surface with sand paper and later scrub it with a wire brush until the lams become visible. If the laminations are shorted on the top, you will for sure get some eddy current losses. It can be pretty significant so you did the right thing by trying to isolate them. Amazing can they make the housing of plastic. 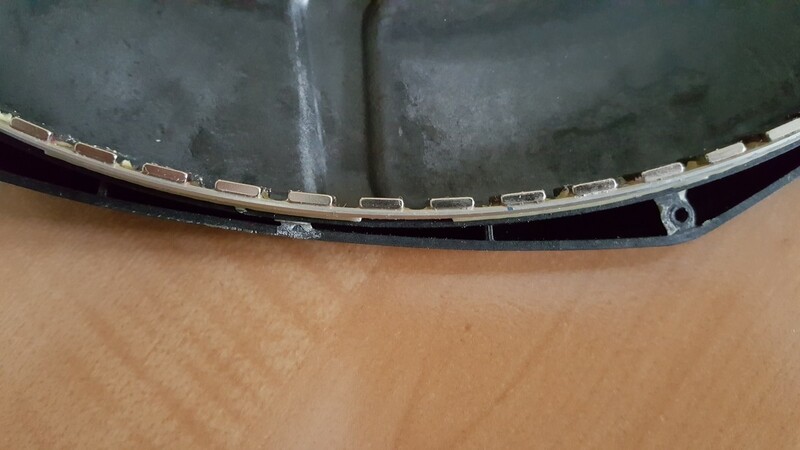 The back iron on the magnets seems really thin. 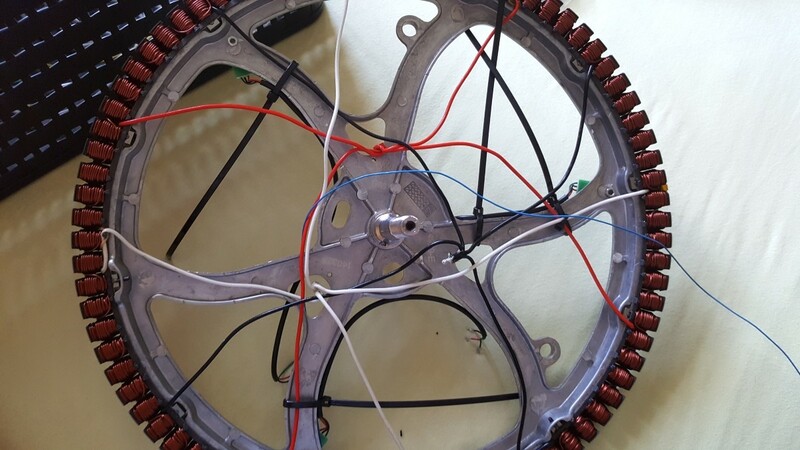 With such a high pole count and large stator diameter, the thing should be pretty good at climbing hills. Copper fill looks good. 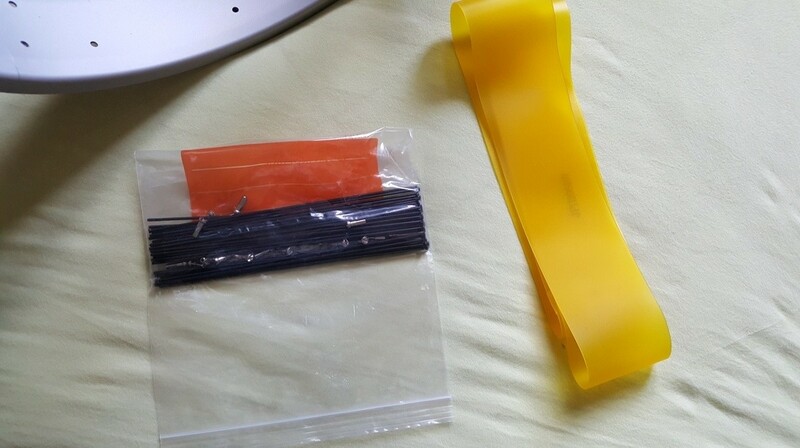 That plastic is some sort of reinforced stuff and i believe it can withstand high temperatures. 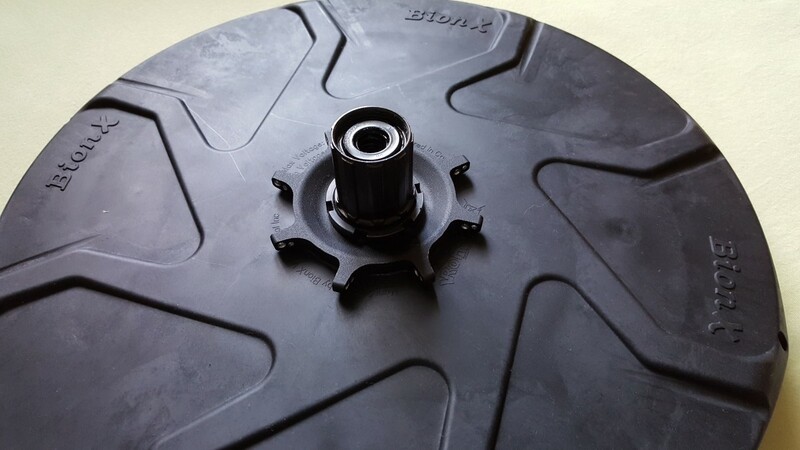 On each cover the spoke flange is attached with bolts (for torque transmission) and each has two bearings. The coming weekend i plan to finish the wiring and hook it up to a small trapezoidal controller for measuring no-load watts and kV. They are physically located with a 120° twist on the stator (3 x 1/3 circumference) but not sure if that means anything.. I already did some wiring on the hall sensors. There was a board between controller and sensor. The sensor is soldered reversed to a foil which is sticked onto the stator teeth at the sides. The sensor is a bipolar type (it will switch if a magnet passes and than it stays in this condition). On the end of the board are two components soldered between the +5V supply line. 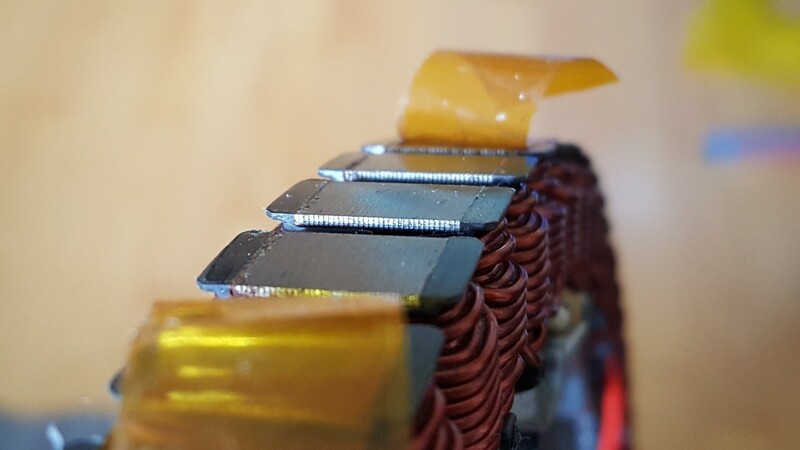 One should be a capacitor for improving the signal quality (switching accuarcy) of the sensors, but i don't know what the black part should be good for. maybe a zener diode? Anyways, very well done bionX and thumbs up! What is the outside diameter of the plastic motor housing? Would it fit a 20" rim? I can't help but wonder if it is as efficient as say, a leaf, or mxus with 0.35mm lams. 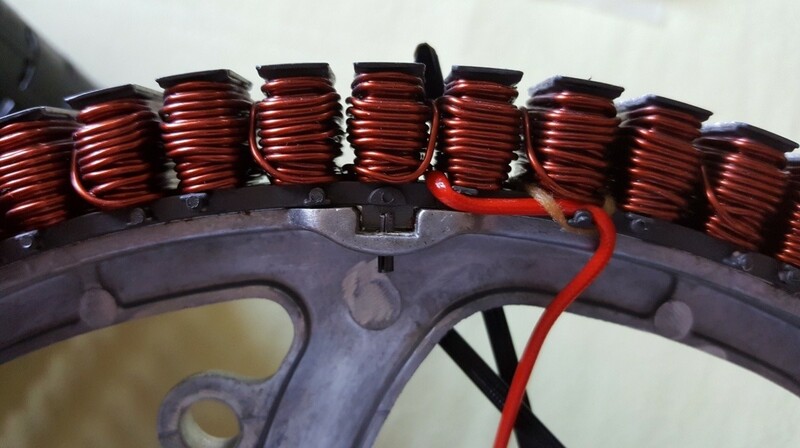 The narrow stator may mean that there is more copper on the edges doing very little work, compared to less tall and more wider motors. 0.27mm lams exist today, and have for a while. If they wanna offer a premium price product.. that's what needed to be inside. Still a cool motor. What does the hub weigh? neptronix wrote: 0.27mm lams exist today, and have for a while. If they wanna offer a premium price product.. that's what needed to be inside. yes as mentioned i was hoping for thinner lams, but let's see how it performs. 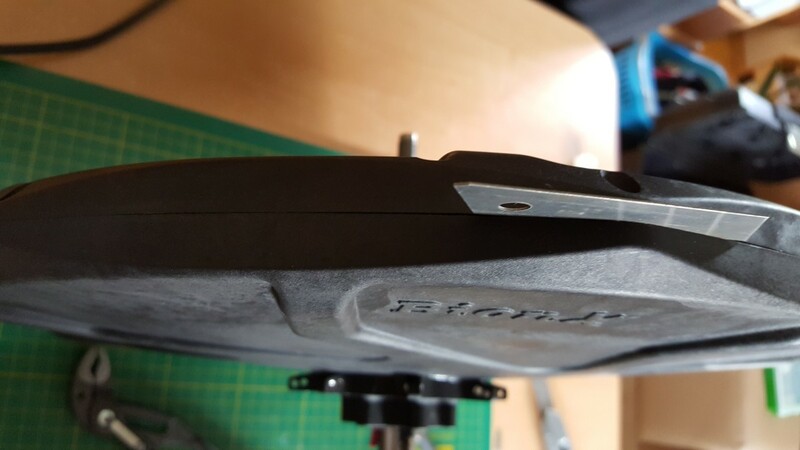 the reason might be that bionx offers this motor only in 26" and larger wheels, so the benefit of thinner lams might have only a marginal effect at such low RPM than. regarding specs it has 4kg (with internal controller). will put it on a scale if assembled again. due to the large housing it needs a really wide rim (for fat bikes). That german company agreed to send me only the rim and spokes (Sapim straight pull). It is about 75mm wide in total, single wall and 800g heavy. 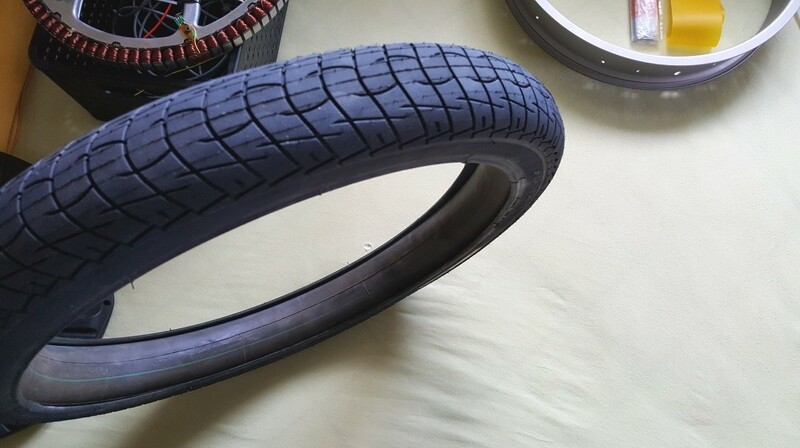 ETRTO is 406mm so 16" moped tires should fit. btw: it has 32 spoke holes. SlowCo wrote: Are you going to use an external controller and a higher voltage to get the rpm/speed up? Yes absolutely, and the internal controller anyway should be defect as it was sold as such in the ebay auction. As for the bike/setup i will frist try it on my Vector with 22s and Max-E as it has 135mm dropouts. If it doesn't work with Adaptto, i will hook it up to a 12FET Powervelocity which should be able to drive it most certainly. whats the limit of Adaptto? and Powervelocity? Yeah. In the newer MAC motor, at beast you can get a 5% continuous performance difference between 0.27mm and 0.35mm lams, based on my reading of the dyno sheets Cutler MAC gave me. Diminishing returns on a large, low RPM motor, for sure..
4kg is pretty damn good. Curious what it is without the controller.. I really wonder what's better.. grin's all axle motor or this ! Hey Madin88, very cool to see this breakdown. I've admired the 'D' series BionX for a long time as an example of successfully taking the the optimized design evolution of a direct drive motor to the extreme and rethinking the mechanics to do it well. 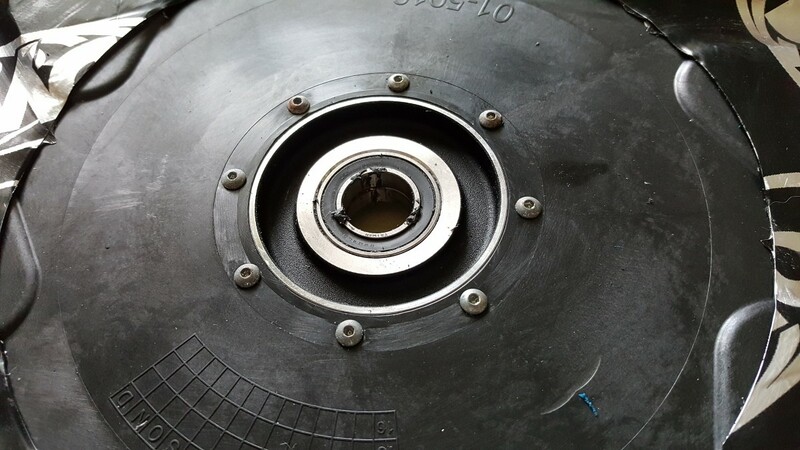 By not having the spokes on the hub shell but on their own flange they got the torque density advantage of a large diameter hub without the weight penalty of massive side covers. I know that BionX struggled a bit having certain RPM's where the D series motor would develop a lot of resonance and vibration, and I'll be curious to hear if you run into this same behavior when you run an external controller. This is awesome. When you get the measured KV value and no-load power draw at 2 different RPM's this weekend, let me know and I could put a first order model of it in the online simulator even without the dyno test and would love to see how those simulation predictions match up with your measured ride experience. It's pole pairs so the hub with 88 magnets has 44 pole pairs, which means 500 rpm is only 22,000 eRPM. 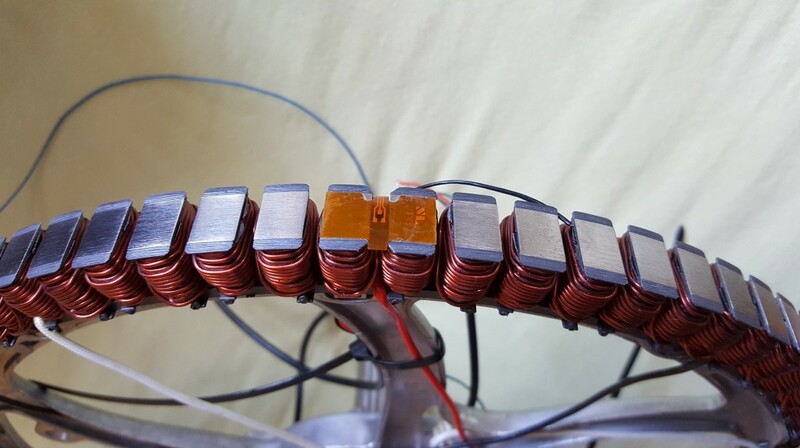 Just about any ebike controller should be able to cope just fine with that. Personally I would just use a sensorless controller to keep things simple. justin_le wrote: I know that BionX struggled a bit having certain RPM's where the D series motor would develop a lot of resonance and vibration, and I'll be curious to hear if you run into this same behavior when you run an external controller. Good point. Some owners reported that it is silent while others said it makes a noise. In my opinion the wheel with the spokes (more or less flexing, torque ripple...) also play a role, aside from the controller of course, but i don't know if the BionX is sine or trapez. 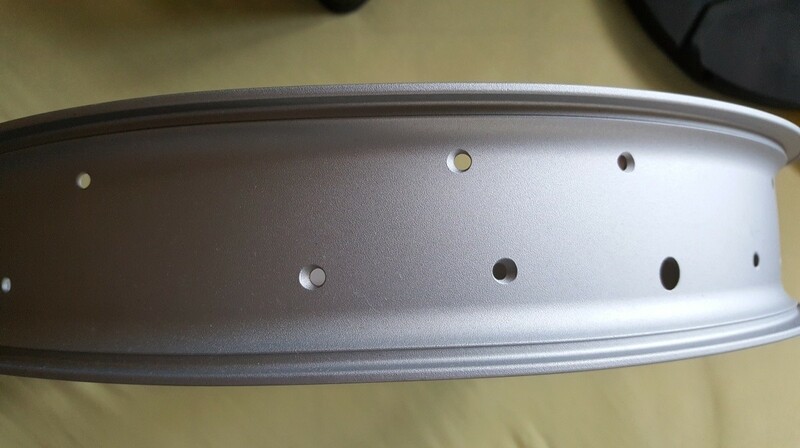 Well, at the inner surface of both sidecovers there is a donut shaped vibration dampening foil sticked onto, which would make sense in view of that. More pics coming. For the measurements i used my calibrated multimeter and the voltage measured dircetly at the controller leads. The first two are done with a cheapo chinese trapezoidal controller, while for the third one i used an Infineon 306 with 3307FET's. Dont ask why... I hope it isn't that important for the data? The noise was like expected to be with a trapez controller, probably a bit louder but it would need a direct comparison with another motor for a precise statement. thats right. thanks for your clarification. I've ridden several ebikes with the D-series motor from BionX, every one was as quiet as any sine-wave controlled direct-drive hubmotor I've ever ridden. The tire hum on the road was the loudest noise, so I don't know how any other style of system could be quieter. when it was 7 phase. is the flux gap under 1 mm? that's as tight as it could be reliably maintained for the diameter back then. Toorbough ULL-Zeveigh wrote: optimal ca. 2005. 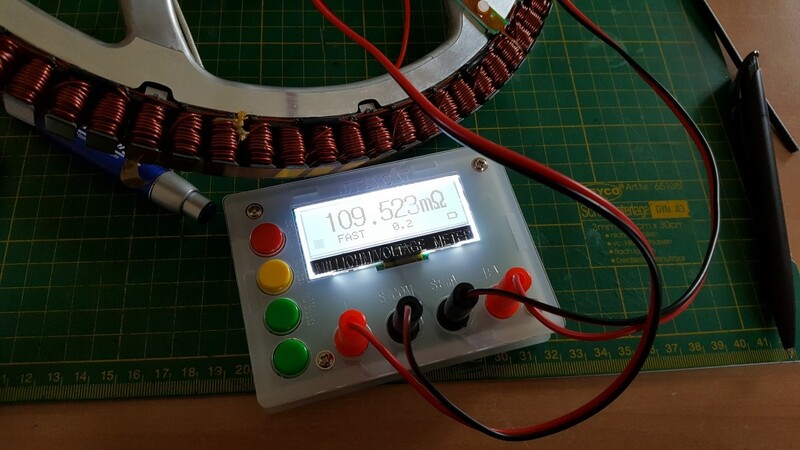 The stator has exactly 340mm OD, but i have not measured the ID of the rotor. will do that as well. With i'ts kV of 10, and 110mOhm resistance, it definitely topped my expectations. To get efficiency i guess it needs a dyno, or would there be a way to calculate it? The 5T 35mm Leaf as comparison has also 10 kV, but it weights above 7kg and has higher phase to phase resistance. btw: the kitchen scale says it weights 4050g incl. wires and a single speed sprocket mounted on the freewheel. Thats awesome, isn't it? I've entered all your data into the Motor Comparison Spreadsheet (see attached). It's the entry in the second row. You can change the values in the columns with a white background. I wouldn't make this official until doing an actual dyno experiment to see that it measures up with the predicted results but it should give you a pretty solid reference footing for what to expect. neptronix wrote: I really wonder what's better.. grin's all axle motor or this ! I would have hoped that the BionX 'D' motor would be at least a bit better than the Grin all-axle motor. All I did was take a generic 205mm chinese motor design and then try to eliminate as much metal as possible that wasn't contributing to motor power, while BionX got to engineer and optimize the entire motor structure from scratch with all the motor dev tools they have at their disposal. And the predicted results seem to show there is merit to the design, with the BionX D motor having a slight edge for power and efficiency at the low end and under heavier loads while the AllAxle motor has a slightly higher peak efficiency when moving really fast. Here is the predicted comparison using the new KV slider feature to normalize them to the same rpm/V. it looks like you'd see about 5% more torque from the BionX D motor during the acceleration phase. Miles wrote: I've entered all your data into the Motor Comparison Spreadsheet (see attached). It's the entry in the second row. You can change the values in the columns with a white background. Nice that you added my data. 202W Cu losses (is plausible from kT and IR), and 67W Fe losses (really not more?). Do you think the values are realistic, or to good to be true? justin_le wrote: I would have hoped that the BionX 'D' motor would be at least a bit better than the Grin all-axle motor. All I did was take a generic 205mm chinese motor design and then try to eliminate as much metal as possible that wasn't contributing to motor power, while BionX got to engineer and optimize the entire motor structure from scratch with all the motor dev tools they have at their disposal. And the predicted results seem to show there is merit to the design, with the BionX D motor having a slight edge for power and efficiency at the low end and under heavier loads while the AllAxle motor has a slightly higher peak efficiency when moving really fast. Here is the predicted comparison using the new KV slider feature to normalize them to the same rpm/V. it looks like you'd see about 5% more torque from the BionX D motor during the acceleration phase. The sidecovers of the D motor are really not that lightweight with that added noise damping foil. Aluminum probably would do a better job IMO, but i'm not saying it has been done bad. Justin, i wonder if you get the same 92,5% peak eta as the spreadsheet says, and what about the eddy losses at higher RPM? are they considered in the simulation? Thanks man for your help! madin88 wrote: Do you think the values are realistic, or to good to be true? They are undoubtedly on the optimistic side. It was never meant to be an accurate predictor of performance. Justin's simulator is much better for that, especially after he's tested the motor on his dyno. The spreadsheet is still useful as a way of quickly comparing one motor with lots of others, though. That steel would help its design work substantially better, but still a crutch. Miles has some incredibly impressive motor magnetic designs. Miles hubmotor magnetic simulation is about perfectly what a hubmotor needs to be. 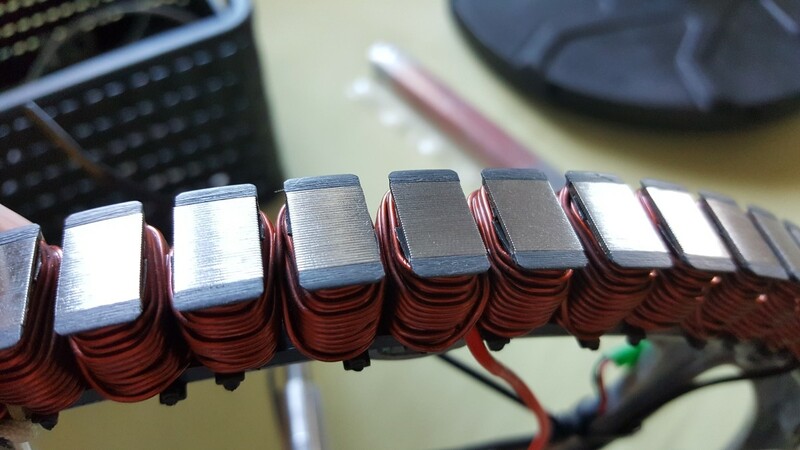 It just comes with the structural packaging challenges to be solved in a way that doesn't substantially increase stator thermal impedance. That motor likely goes up 4-5x in continuous power handling through a widely vented cover, but it adds aero drag and decreases weather and debris protection. It's not a terrible set of motor compromises for large wheel diameter lightweight vehicles, but I'm also surprised at the phase resistance being so high for the Kv. If you compare the phase to phase resistance among hubs with similar kV (or "adjusted" as Justin did), the D motor tops all other motors i know until they going to weight 7kg or more. If i'm wrong, than please correct me. The Grin all axle hub has 140mOhm regarding the specs (with a little higher kV), or the 10kV 35mm Leaf (as you have had on the dyno) has around 150mOhm if i remember correct?? Wait, what did it weight? I am aware that this bionx hub cannot keep up in terms of peak torque when comparing it with physically larger ones (as the core will go into saturation earlier due to less stator surface area), but in view of continuous power, the largest part are copper losses in most cases and exactly here it isn't bad. Yes, everything can be improved further, but as you called it a crutch, do you know about another hub motor in this weight class that can keep up with this one? @ Justin, i'm not familiar with the new functions of your simulator, but could it be that you forgot to set human input to zero on system B?